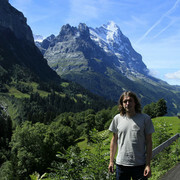 Switzerland is famous for its mountain scenery. 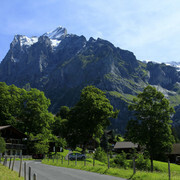 The area of the Alps covers about 60% of the country, making Switzerland the second most Alpine country after Austria. 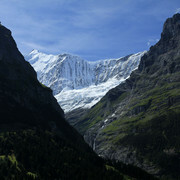 The Jungfrau region is one of the most beautiful places on earth. 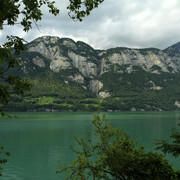 It's a glistening mountain landscape and home to the Alps’ highest concentration of glaciers. 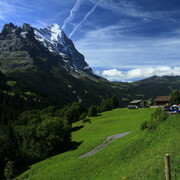 Here you’ll find exquisite hiking trails, hundreds of dazzling waterfalls, and legendary peaks like the Eiger with its fearsome North Face. 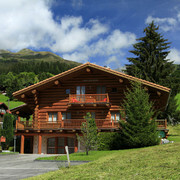 Another beautiful Swiss region, Val Ferret, is called "Heidi" country. Just off the Tour de Mont Blanc walking path, this alpine valley site has the glacial views, the meadows, the forest, the river of freezing ice melt and the men in the valleys cutting grass with scythes. 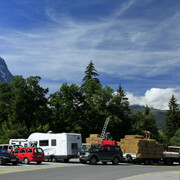 Camping des Glaciers at 1,600 m. above sea level is set amidst magnificent mountain scenery in a quiet, peaceful location in the beautiful Ferret Valley. Camping in this remote Alpine valley is the last word in get-away-from-it-all breaks. At this altitude the sun can be laser hot and the nights icebox cold :).